Weber High school is located in Pleasant View, Utah about 5 miles north of Ogden,Utah. It serves the residents of Pleasant View, North Ogden, Harrisville, Huntsville, Eden, and Liberty. Expectations from family, faculty and administration are high. Students are very respectful and considerate of their peers and adults. The community is comprised of mostly middle to upper class homes. Weber School District is located in northern Utah in the heart of Weber County. Nestled within the Wasatch Region, Weber School District serves the educational needs of Weber Cone, Fremont Cone, Roy Cone and Bonneville Cone. The District is one of the state’s largest and fastest growing areas boasting a diversified economic base. Currently, the district consists of seven high schools, ten junior highs and 29 elementary schools utilizing a K-6, 7-9 and 10-12 grade-level configuration. Weber High School, an IB World School, is accredited by AdvancED and is a 6A comprehensive three-year public high school with an enrollment of approximately 2000 students in grades 10-12. Weber is located in Pleasant View, Utah about 5 miles north of Ogden,Utah. It serves the residents of Pleasant View, North Ogden, Harrisville, Huntsville, Eden, and Liberty. Most students are high achieving and 90% will go on to pursue additional education at either a four-year or two-year institution of higher learning. Weber High School offers a diverse curriculum designed to meet the academic and socio-emotional needs to all leaders, and includes over 30 Concurrent Enrollment classes and 17 Advanced Placement classes. The academic program is organized on a block schedule. Eight credits per semester is the maximum course load; students take eight 80-minute block classes and one 40-minute class called FLEX. Students attend four block classes and the FLEX class daily. Block classes are semester-long; each block class meets every other day. The FLEX period is a multi-purpose class period. It is held every day, except Mondays, for 40 minutes. Students can choose to take a study hall or a regular class. If a student has failed a class or is off-track for graduation, that student will be assigned a particular FLEX class for remediation or additional help in that subject area. Additionally, students may use the FLEX period – with prior teacher approval – for make-up or test re-takes or additional help/tutoring from one of their teachers. All student assemblies and announcements will take place during the FLEX class period. These AP courses are offered: Art History, Biology, Calculus AB and BC, Chemistry, English Language and Composition, English Literature and Composition, Environmental Science, European History, Psychology, Studio Art, Government and Politics: United States, Government and Politics: Comparative, Physics 1, Statistics, United States History. AP world language and culture courses offered include German and Spanish. AP is an open-enrollment program. IB classes offered are: IB Language and Literature HL, IB Spanish B SL or IB Ab Initio Spanish SL, IB History HL, IB Biology HL/SL, IB Chemistry HL, IB Math SL, IB Visual Arts HL/SL and IB Theatre SL. Please refer to http://weber.wsd.net/index.php/staff-directory/ib-international-baccalaureate for more information and application. Honors classes are offered in English 10, English 11, United States History, World History, Math 2, and Math 3. The Concurrent Enrollment (CE) program enables juniors and seniors to enroll in courses and earn college credits at local institutions of higher education. There are currently over 30 CE classes that are available for students to take. Class rank is based upon Grade Point Average (GPA). GPA is computed using the above quality points. Beginning with grade nine, all subjects, whether passed or failed, are included in the computation. A minimum of 27 credits is required for graduation. In addition, each student must complete the Civics Test. Grades are recorded on the transcript and GPA is computed at the end of every quarter. ● 1.0 of your choice: English 12, AP Literature & Composition, Creative Writing (0.50 credit), Journalism, or Debate. You may also chose WSU Intro to Interpersonal Communication (COMM2110) with a cumulative 3.0 GPA or better; WSU Intro to College Writing (ENGL1010) with a cumulative 3.0 GPA or better & a minimum of 17 on the English & reading portions of the ACT. If you score a 29 or better on the English portion of the ACT or pass the AP Language Test with a 3 or better, you may use WSU Intermediate College Writing (ENGL2010) for your English 12 credit. ● Parents may sign a formal request in the PCCR for a student to replace Secondary Math 3 with one of the following math classes: Statistics, AP Statistics, AP Calculus, College Prep Math, Accounting 1 & 2, or Math Decision for Life. ● At least 2.0 credits from the four foundation areas of science: Biology, Chemistry, Physics, & Earth Systems. Each science area has an AP option available. ● One additional credit must be completed from the foundation classes or one of the following: Astronomy, Animal Science, Digital Electronics, Medical Anatomy & Physiology, Medical Forensics, Natural Resource Management, Plant & Soil Science, AP Environmental Science, or Principle of Engineering. ● Students must also pass a Basic US Civics Test to receive a high school diploma as of January 1, 2016. The test will be completed in the US Government/AP Government class. ● Fitness for Life is required for 0.5 credit of the total 1.5 PE credit needed. Weber High School offers a rich set of extracurriculars to supplement its core academic program. Below are the extracurricular opportunities available to students. We do not widely promote the SAT test and have very few students that take it because the majority of our students go to in-state schools that only require the ACT test. *The majority of these students serve a 2-year LDS mission right after high school graduation before starting college. Wee Weber’s objective is to help high school students learn appropriate practices when teaching young children. Objectives for the children: high school students will be teaching the children in all the basic areas of childhood learning, including: math, science, language, reading, music, art, gross motor and fine motor skills and much more. Class sizes are limited to 18 per class. Registration is on a first come first serve basis. If classes fill up, a waiting list will be started and you will be notified of openings according to the list. 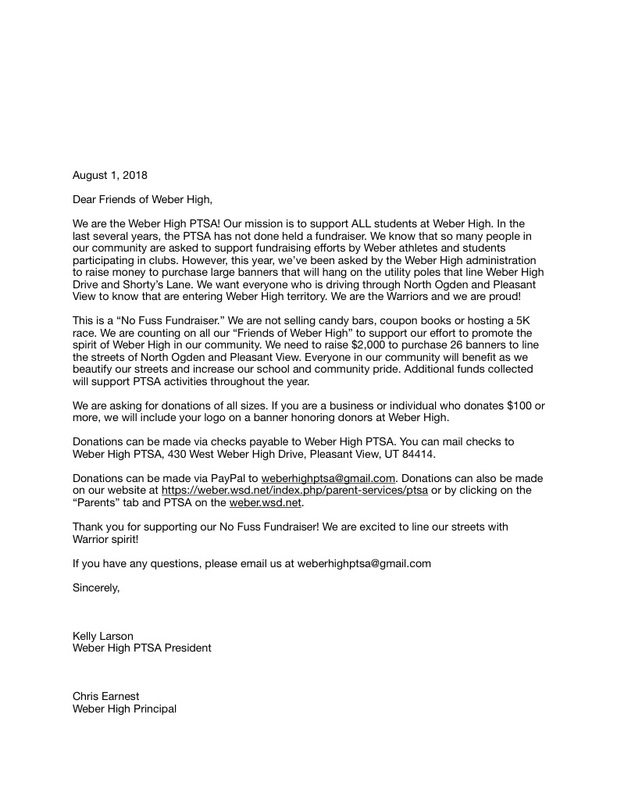 Fundraising letter for Weber High road banners that will go up along Weber High Drive and Shorty's Lane. APPLY NOW TO BECOME A PTSA STUDENT REP! We are looking for fun, motivated, responsible students to serve on our PTSA student council. We would like representatives from each grade. If you would like to join our PTSA student council and help with great activities at Weber High then please apply! Applications are due September 14th.